Researchers at Harvard and MIT have spent the last seven years perfecting this robotic bee. The result is Robobee, a mechanical bee so lifelike it kind of makes you want to duck indoors. The researchers released new video showing Roboee demonstrating its latest trick: It can land and perch sideways on a wall, just like a regular bee (right before it dives at your soda). Perching isn’t Robobee’s only skill, of course. It can swim, fly with incredible agility, navigate obstacles, and hover using its wings. At just 84 milligrams, Robobee is also almost precisely the size and weight of a living bee. In fact, it’s so good that researchers are adding a new potential job to its resumé. In addition to being a reconnaissance and communication robot, researchers now hope it could also someday be used as a robotic pollinator. We depend on bees for an incredible amount of our food supply—and we’ve been losing them at an alarming rate. A cyborg pollinator, if it could actually do the job, could help solve at least some of the problem. Unfortunately, although Robobee has learned a lot of bee skills, pollination is much more than a mechanical process. Even if the technical skills could be perfected enough to let Robobee pollinate without crushing plants, programming it to recognize which plants to pollinate and which to leave alone would be remarkably complex. There’s also the pretty significant matter of Robobee’s tether. Currently, the robot gets its power for a wired connector. Researchers are working on a power system that it could carry with itself, but they say its probably another 5-10 years away at least. 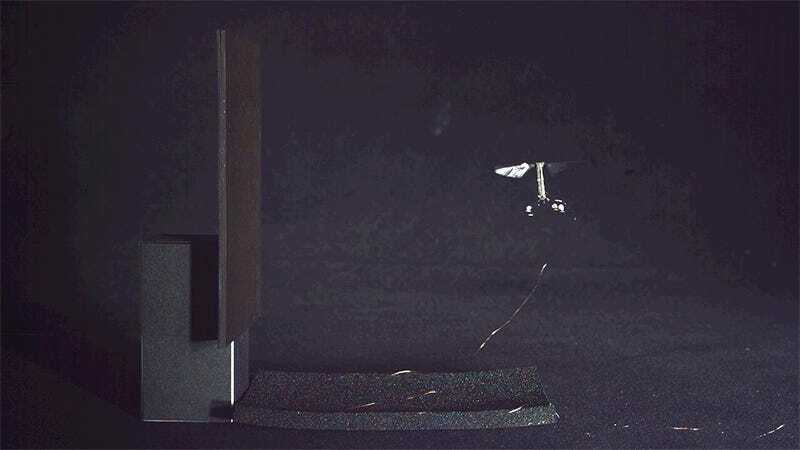 Still, even if its not quite a cyborg bee replacement, Robobee is an incredible example of a microrobotics success. Though its unlikely to replace bees as pollinators, it’s easy to imagine plenty of other jobs this little robot could manage handily.